Barça battle Leganés to a 3-1 victory. 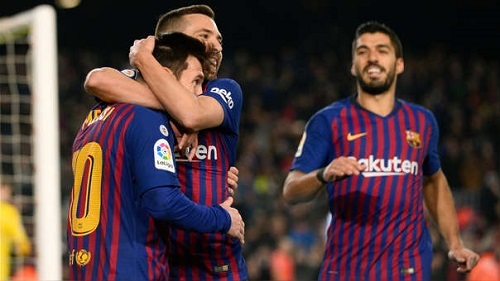 FC Barcelona got some Lionel Messi magic in their 3-1 win over Leganés today after he came off the bench to help create a goal and score the insurance that kept the Blaugrana five points clear at the top of the league standings. Messi started the game on the bench and his absence wasn’t missed when Barça took the lead in the 32nd minute after Dembélé did his best Messi imitation as he glided past players before combining with Jordi Alba and scoring from the middle of the box. Unfortunately, Barça failed to add to their advantage and the visiting Leganés scored the equalizer in the 56th minute through Braithwaite. Valverde decided to bring on Messi in the 63rd minute along with Rakitic and seven minutes later, Barça scored the go-ahead goal after a Messi strike was too powerful for goalkeeper Ivan Cuéllar to hold on to and Luis Suárez was quick to react and pounce on the ball and score before Cuéllar managed to get possession again. A VAR review ruled in favor of the Blaugrana and Messi would score the insurance goal in stoppage time to guarantee the three points. Barça now sit atop of the league standings with 46 points, five points clear of rivals Atletico Madrid and nine clear of third-placed Real Madrid after 20 league matches. Unfortunately, this result was bitter sweet when Dembélé had to be substituted after suffering an ankle injury and the club announced that he will undergo more tests on Monday to know the exact extent of the injury. Barça will have a few days to rest before traveling to Andalusia country to face Sevilla in the first leg of their Copa del Rey Quarter-Finals clash. FC Barcelona: Ter Stegen; Sergi Roberto, Piqué, Vermaelen, Jordi Alba; Sergio Busquets, Aleñá (Messi, 63′), Arthur (Rakitic, 63′); Dembélé (Malcom, 68′), Luis Suárez & Coutinho. Leganés: Cuéllar; Nyom, Tarín, Omeruo, Siovas, Jonathan Silva; Óscar (El Zhar, 85′), Recio, Vesga (Eraso, 85′); Braithwaite (Santos, 77′) & En-Nesyri. Goals: 1-0, Dembélé (M.32); 1-1, Braithwaite (M.56). 2-1 Luis Suárez (M.70′). 3-1, Messi (M.92′). Cautions: Braithwaite (7’), Sergio Busquets (11′), Omeruo (29′), Aleñá (53′). Previous PostBarça defeat Levante 3-0 to advance to the Copa del Rey Quarter-Finals. Next PostBarça Announce Loan Agreement for Kevin-Prince Boateng.